The main difference between workstation and server is that the workstation is a special advanced device that is capable of solving high end technical and scientific problems while a server is a special device that provides services to the client machines connected to it. A workstation is a device designed for scientific or other heavy usage applications. On the other hand, a server is a device that provides functionality for other programs or devices called clients. A workstation is a special computer designed for scientific or technical purposes. Usually, desktop computers are not suitable for technical tasks. Therefore, devices with better specifications called workstations are used. 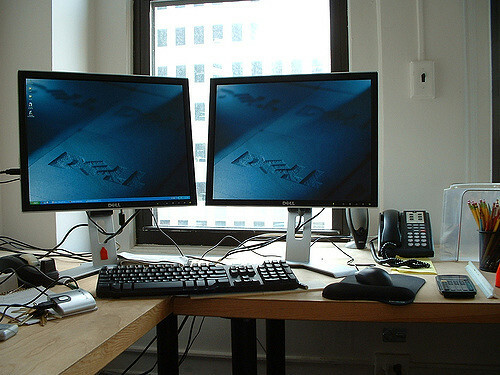 A workstation can be a mainframe computer terminal or a PC connected to a network. The Organizations such as Silicon Graphics, Apollo computer, HP, DEC, and IBM manufacture the workstations. A workstation can consist of multiple displays and input devices apart from a mouse and keyboard. It can also have programmable keyboards, controllers, and high-quality speakers. Moreover, a workstation provides high memory capacity and multi-tasking capabilities. Therefore, a workstation performs better than a usual personal computer. Furthermore, workstations can handle complex data in 3D mechanical design, animations, image rendering, and mathematical plots and various engineering-based simulations. Therefore, a workstation is an advanced machine with accessories and collaboration tools to accomplish complex tasks. A server is a special device that provides services to its connected devices. These devices are also called end-user devices or clients. 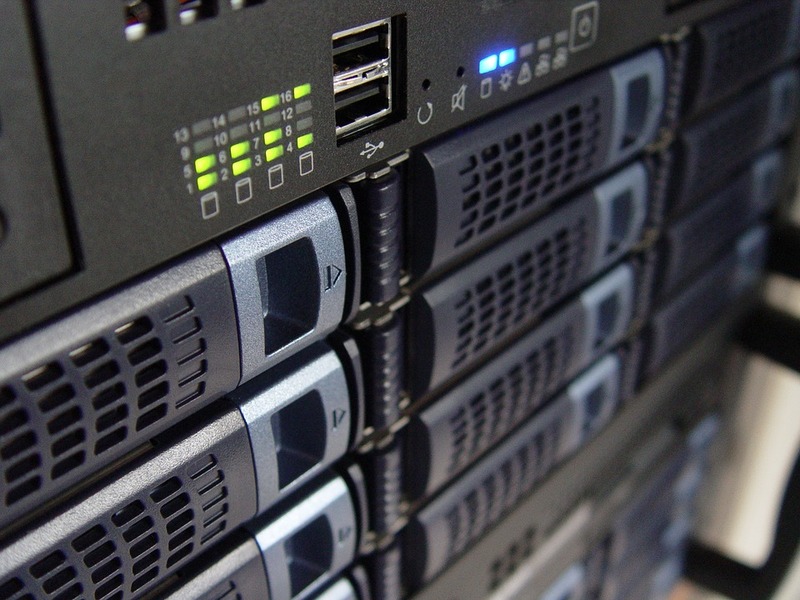 A single server can provide services to multiple clients at a time. There can be multiple servers in a single machine serving different clients. Generally, a server runs uninterruptedly. Clients and the server communicate with each other via the network. The clients send requests for services from the server. Then the server responds back to the client by providing the service. There are various types of servers. A web server provides web resources according to client requests. Application servers provide business logic to application programs by using different protocols. File servers provide files to clients. Database servers run DBMS. Furthermore, a mail server sends and receives emails using standard email protocols. 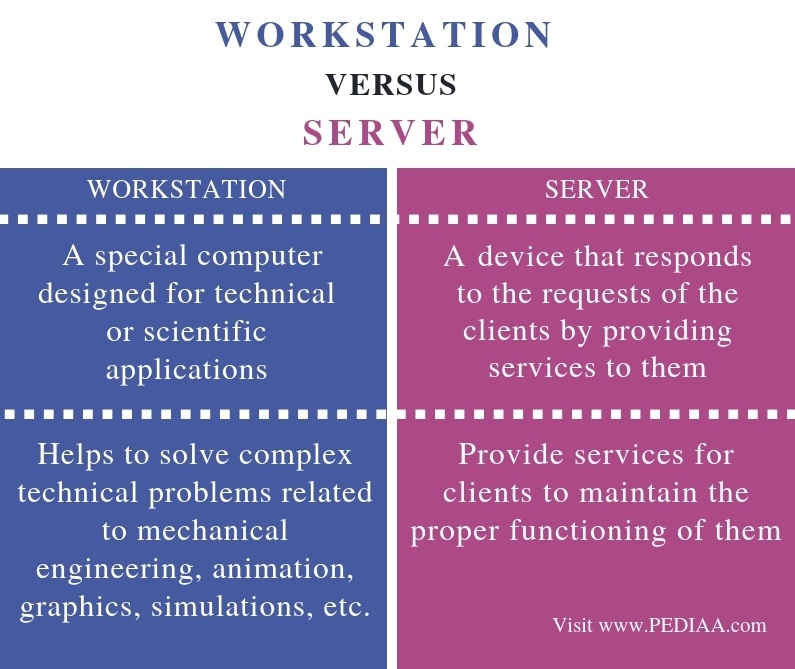 A workstation is a special computer designed for technical or scientific applications while a server is a device that responds to the requests of the clients by providing services to them. Thus, this is the fundamental difference between workstation and server. Another difference between workstation and server is that workstations help to solve complex technical problems related to mechanical engineering, animation, graphics, simulations, etc. while servers provide services for clients to maintain the proper functioning of them. 2. “The Client Server Model | Clients and Servers, WebDev Cave, 20 May 2016, Available here.